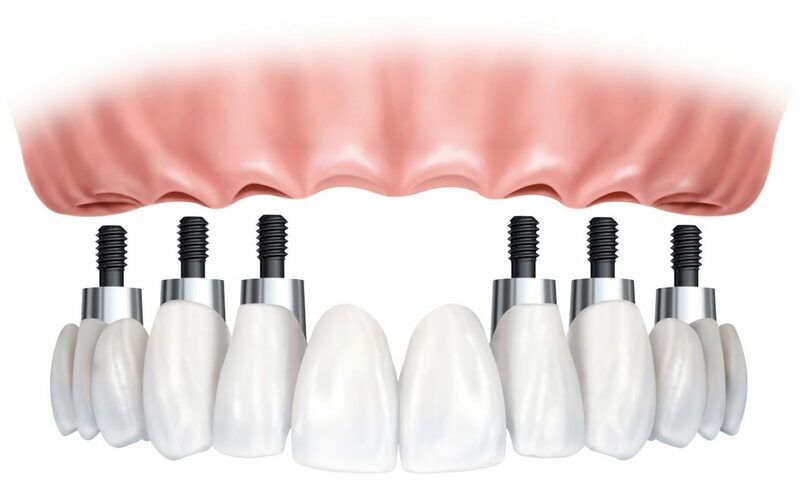 If you are missing many teeth and beginning to look into dental implants as a tooth replacement option, the “All On 4” and “All On 6” procedures may come up during your research or discussions with your dentist. The good news is that these treatments are very similar and look to achieve the same results, but do have some key differences that could make a dentist recommend one procedure over the other. The Basics all on 4 vs all on 6 dental implants – which is right for you? Both All On 4 and All On 6 are effective solutions for people who have lost a significant number of teeth. 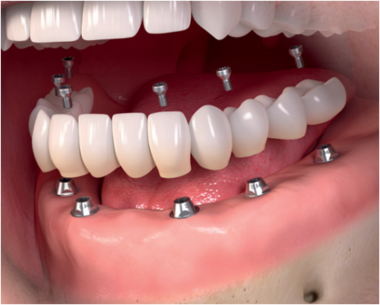 Both treatments involve surgically placing dental implants in your jaw. 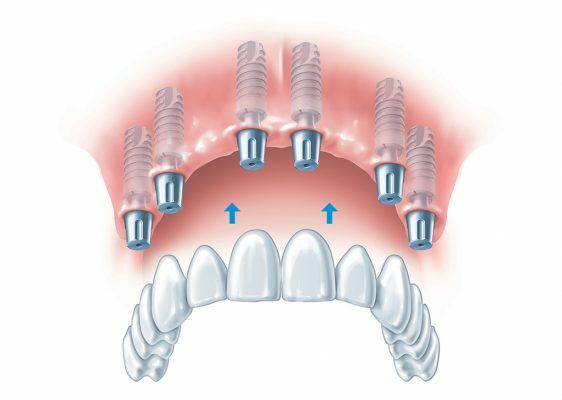 These implants are used to support fixed or removable dentures and to maintain your jaw’s structural integrity following tooth loss. Both procedures typically take about two to three hours to be completed. If you have a busy schedule then getting the procedure completed all at once is a big plus. During procedures the patient is usually under oral consciousness sedation. If you have dental anxiety then this is a big plus to help you through the procedure. In both cases, the implants bond with the jaw to mimic the pressure placed on it by your natural teeth. The name “All On” comes from the fact that your fixed or removable denture (also called overdentures) will fasten to four or six implants, depending on the procedure. Imagine all of your teeth being connected and only having four or six roots that go into your jaw. 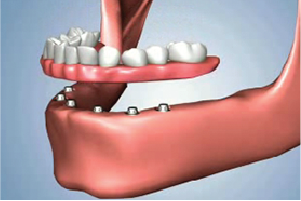 That is essentially what these procedures offer rather than needing an implant for each missing tooth. In the past, replacing an entire set of teeth would typically require many more implants, could include jaw bone grafting, and would need about 6 months of healing before your mouth would have been ready for the crowns or dentures. With the “All On” approach, there is less healing since there are less implants, and temporary dentures can usually be installed at the same time until your permanent dentures are ready (typically within 3 months). Permanent dentures take several forms depending on your preference. There are options that are removable for cleaning (overdentures) and those that are permanently attached to the implants (fixed). Which you choose will depend on your preference and your lifestyle. Be sure to discuss your options with your dentist. The most obvious difference between All On 4 and All On 6 dental implants is the number of implants that are added. All On 4 utilizes four implants, while All On 6 uses six implants. However, there are more differences to consider which is why most dental practices will choose which procedure they prefer based on their own clinical opinions and practices. At DocDental Smiles, Dr. Tran, dentists recommend the All On 6 procedure because we believe that it provides better strength and stability, resulting in a more comfortable and longer lasting smile. Each time you chew or bite into something, it’s important that the pressure is dispersed evenly onto your implants and through to your jaw. We believe that the location and placement of those two additional implants provide a significant amount of added strength, stability, and long term benefit. 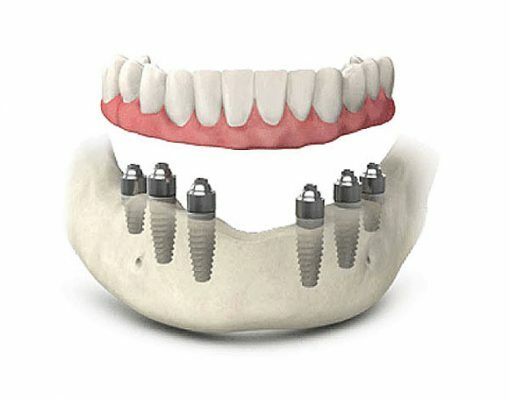 Not only do these additional implants provide more support for your bite, they also provide more strength for your jaw. Did you know that without teeth, your jawbone actually begins to break down? This is the reason why people that have worn dentures for an extended period often look much older and their jaw will appear to be sunken in when they remove their dentures. With dental implants, this doesn’t happen because the implant stimulates the jawbone and helps keep it strong. The All on 6 approach provides added stimulation and strength to your jawbone. All on 4 vs All on 6 Dental Implants: Which is Right for You? Both All On 4 and All On 6 dental implants are great solutions for people who have lost many teeth and want to regain their smile. Overall, the adjustment and recovery period is minimal and it won’t take long for you to forget the implants are even there.